Model C-3. Anybody know anything about the early radio history of Wurlitzer - pre 1926? "Joe" posted some comments under the video. He is/was a collector of these early Wurlitzers. But even he isn't sure who made it. Not sure why they used the name on this piano, or how common it is compared to ones branded with their own name. I do know that they used the Lyric name on some of their instruments, as well as at least one of their jukeboxes. In the first volume of Alan Douglas' book Radio Manufactures of the 1920's, page 20, is a good description of the relationship Wurlitzer had with All American (joined with Mohawk) and Rauland. They were using the Lyric name since 1927 and registered it in 1929. It looks like they used the name for one product or another since then. There is no mention of the origin of radios sold under the Wurlitzer name prior to 1927. Russ, it's odd that you brought this up. I've been looking into early Wurlitzer radios recently and have documented quite a few. I don't know who made your set yet, but I had a Deforest with a similar leatherette finish once. Wurlitzer had 20 stores in Chicago during the mid 20's. I'm uncertain how many stores they had in total, but it must have approached 100 or so. They advertised "coast to coast" in their ad copy. They were like the Best Buy of the 1920's and 30's and must have sold a lot of radios. They were big enough they very well might have sold different private labeled models in different regions of the country depending on what deals came along. Apex was likely a one time deal due to the massive over production of the Super Five. Buckingham never made any of their own cabinets. They made radio chassis only and promoted private label business to large retailers, dept stores, auto stores, etc so their models might be found in numerous cabinets depending on how the end customer chose to market the set. They went bankrupt in 1930. The little info I have on the early Buckingham branded sets suggests Wurlitzer made the cabinets. I am developing a history on Buckingham that I will update soon at the Radiomuseum. Buckingham's president was an interesting character. He found himself locked up overnight at the Cook County jail on two different occasions. It's a shame Mohawk merged with Rauland because it distorts the history. Mohawk and All American should be evaluated at the time the set was made and what label it carries because these were two completely independent companies for most of their existence. I hear people calling All American sets Mohawk and vice versa which drives me nuts . Wurlitzer sold Mohawk radios under both the Mohawk brand and also under the Wurlitzer brand. Some of the 1927-28 models were made with a completely different escutcheon plate instead of the traditional arrowhead. The knob layouts were the same. This was done no doubt to disguise them from the models being sold by Mohawk's independent dealers. Mohawk like Buckingham sold both under their own name to a dealer network and also took on private label business at least for Wurlitzer and as I've already mentioned I believe both companies relied on Wurlitzer to supply their cabinets. Mohawk made horizontal mounted exposed tube phonograph radio units for Wurlitzer and others. I'm 100% convinced Chieftan was Mohawk's attempt to dump their remaining inventory of 1st generation one-dial phonograph radio units. Chieftan was listed in one of the radio publications as being located at Diversey and the bridge. That is the exact location of where the Mohawk factory was. Alan D once argued with me that Chieftan wasn't the same, but he was wrong and I didn't know what I do today. Mohawk introduced a 6 tube "H" layout horizontal mounted exposed tube phono set that was offered in Wurlitzer's phono combo console units. This new 6 tube model would have obsoleted their old stock of phono units so I believe they made up some "Chieftan" labels and got rid of them that way. BTW, there is a Chieftan set on ebay currently. I don't want to cause any trouble with ebay sellers, but that radio has had some serious cabinet modifications. 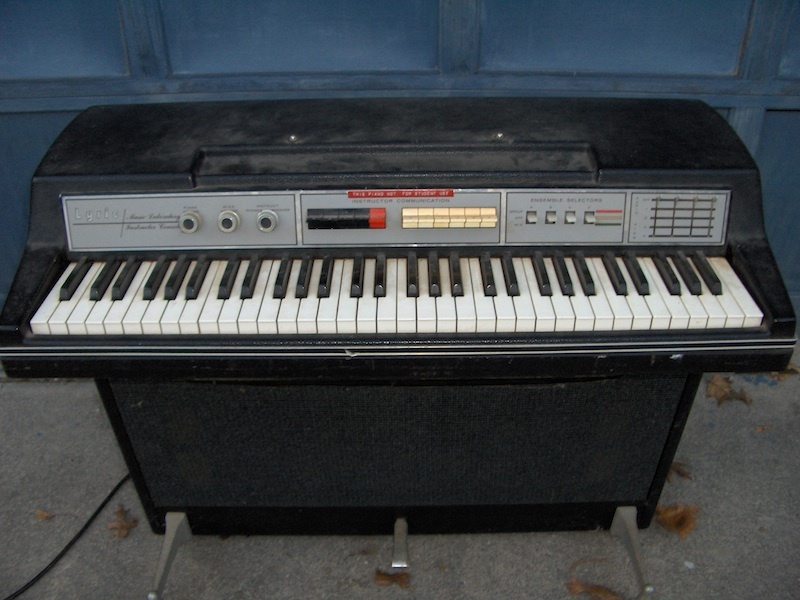 Nice video and interesting tuning set up on that Wurlitzer Russ. Could you please tell me the name of the song and artist played in your video? Really like that tune. The recording(s) were hosted on a old radio programs site that had a lot of material. At first you could download the MP3s, so I did - a lot. Then you could only listen - then you could download (again) - then you could not (again). At that point I removed the site from my favorites list. Any way I'll have to listen to the recording again to get the song name since Tommy did introduce much of the music by name. I used the station/recording for the video in lieu of "talk radio" (noise). Last edited by phlogiston on Mar Sat 04, 2017 5:48 pm, edited 2 times in total. Matt, that is very good. Alan's book does lead me in that same direction. The important piece that is missing is pre-1927. This seems unusual since by that time Wurlitzer was already an old, well established company that survived, intact, until nearly the end of the century. I saw the logo (below) on some of the parts. I had seen it before but could not make out the inscription until I enlarged the photo. I had been thinking that it was in some way related to Rauland. Now I can make out "PACENT" as the name on some of the parts. Another interesting note is that the All-American ad pictured on page 21 (vol I) of Alan's book shows an audio transformer (upper left) with "Rauland Mfg Co" on the label long with All-American. Rauland left All-American in 1929 but they used both names prior? Last edited by phlogiston on Mar Sat 04, 2017 5:48 pm, edited 1 time in total. FWIW, the tune in the video is "When Buddha Smiles"; the arrangement is one used by the Benny Goodman Orchestra in 1937 or so, but it doesn't sound like Goodman's band (I find it hard to tell, the audio's a bit distorted). I *think* the arrangement is by Edgar Sampson, so it very well could be the Dorsey Orchestra - Sampson sold them a lot of arrangements. You are probably right. I still need to go look at the file(MP3). I also have lots of Benny Goodman on that disk. "The Audio is distorted" But it has that WARM tube squeal! Russ, I've got Alan's book at the office so I don't have it front of me right now, but All-American was a trade name of Rauland Mfg Co like Lexus is a trade name of Toyota. Blog on your website? Sure it's okay with me. I've got a few more things to check out that requires a roadtrip before I can finish up with Buckingham. Hopefully I can do that later this week. Here's a link to the DeForest I mentioned. The cabinet looks like it could be a cousin to your set. 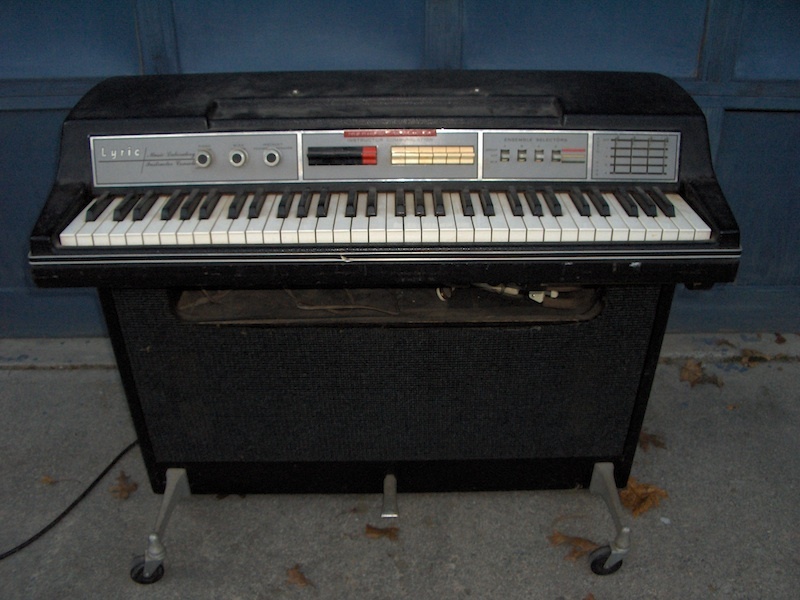 There was a similar DeForest in the same collection that the Wurlitzer came from. It was the one with the crystal detector, I think a model 2(?). Yes the cabinets were both finished with the faux leather. It was sold on P-Bay. Blog updated with Matt's post. 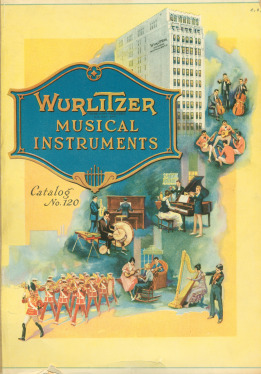 I was recently fortunate to locate and borrow a 1921 Wurlitzer catalog. It is Musical Instrument Catalog No. 120 dated 1921. As it's name suggests it is 100% musical instruments. Too early for radios that probably would not have been included in an instrument catalog anyway. There is some interesting history of Rudolph Wurlitzer and the founding of the company in Cincinnati. I think most of this is already on the internet so nothing earth shattering here. One thing that caught my attention was discovering Wurltizer's use of the "Lyric" name predated E. N. Rauland's use of the name for his R500 audio transformer in 1924. I had assumed the "Lyric" name originated with Rauland's transformer and now know that to be incorrect. Makes me wonder if the Rauland part of the All American Mohawk merger and subsequent sale to Wurlitzer might have been part of a larger out of court legal settlement regarding trade name infringement. That Mohawk was sold to Wurlitzer was logical given their former business relationship, but I never understood Rauland's role. The merger offered no strategic benefit to Mohawk from a technical or marketing perspective. Mohawk was far stronger in sales, owned the ganged condenser patent, and was one of the first to receive an RCA license for ac tubes. Perhaps by merging the two companies it solved Rauland's possible legal dilemma without public embarrassment? Or perhaps Rauland's "Lyric" trademark was legally solid and the merger of Mohawk Corp of IL and All-American Radio was a stipulation of Wurlitzer's purchase of Mohawk so that they gained full rights to the Lyric name? Either way I'm convinced there is no way Mohawk and All-American would have ever merged were it not for the "Lyric" name. The catalog is fragile so I only scanned enough to give you a good idea of its' contents. It seems the Rudolph Wurlitzer Company distributed a lot of other items and brands in its history, besides radios. This catalog from 1908 shows their product line included Victor and Edison phonographs, as well as musical instruments and other items manufactured by them. The greatest success of this company was probably their automatic phonograph line (jukeboxes), which they introduced in 1934, and stopped manufacturing in North Tonawanda about 1973.
matt's, There is likely something to what you say about the proximity of the the "Lyric" name with the two company's. Yet, I would like to humbly offer a partial explanation about trademark use. The granting of a trademark protection is in a very narrow and limited way. That is, the trademarks are applied on a specific type of products. Therefore, it is possible to have a Ford automobile and Ford chewing gum, or Cadillac automobiles and Cadillac lathes, or Johnson's baby products and Johnson's sporting goods. All those examples are unrelated companies sharing the same trademarked name for different products, or product lines. In the case of the Lyric transformer and the the Lyric radio, it is possible that litigation was not warranted because the two items are different enough products.